Information Outsource is a division of Standard Printing Company, Inc., a Phoenix-based printer established in 1952. Since 1998, Information Outsource continues to grow from the needs of clients who recognize the benefits of outsource billing services. We specialize in electronic bill payment services (E-Bill) and outsourcing the processing and distribution of billing statements. We believe our competitive advantage is the hands-on quality service we provide each and every customer. The emphasis on quality permeates throughout the entire organization and impacts every process and procedure we have in place. Information Outsource and SPC offers printing services for every need. Explore these services below to find the one best suited for your organization. Our Mission is to service our clients’ needs by providing innovative print and mail solutions, imaging, sorting, archiving, and delivery solutions with excellence and skill. We understand that making the change to an outsourced solution is a big step. Budgets, equipment maintenance contracts and staff all come into play when evaluating whether to keep your electronic billing solutions and functions in-house or look to a vendor to complete these print and mail solutions on your behalf. Let us help you in your analysis by presenting a clear, streamlined solution with an easy transition plan. Need a New Print and Mail Provider? Let us take the stress out of your mailings. With state-of-the-art production facilities, SOC II Type 2 security certification, disaster recovery channels, and full-time development staff, we are ready to remind you how quality control and proven automated processes can take the guess work out of your routine customer outreach. We guarantee timely management of your data, electronic billing, correct mail pieces and thorough customer service. Looking to add an online billing component to your customer outreach? Need an integrated archival method to work with a payment processor or bank? Want to segment your client base for targeted outreach? Let us introduce you to our full suite of solutions to meet your current and projected business needs. As your customers’ needs evolve, we have a solution every step of the way. SOC 2 concerns the internal controls in place at the third-party service organization. 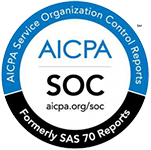 For a company to receive SOC 2 certification, it must have sufficient policies and strategies that satisfactorily protect the client’s data. The Information Outsource office is located just a few miles west of downtown Phoenix off the I-10 and I-17 freeways. We are a one stop shop for all your billing, printing and mailing services. All materials and printers are housed in our onsite warehouse. Wow, it’s amazing how many years we have been your customer!! You have always done a great job of working with our staff and most importantly getting our customers their bills. Thank you for being such a trustworthy company!! Thank you for the amazing work you have done for us and thank you for being so accommodating and responsive. We would not be making our deadline if it wasn’t for you and your team!! I will not only be a reference for your company but a spokesperson! Information Outsource is a true business partner where we can bring ideas we think will help our business and work with us to determine the best course of action to meet our needs. They provide their solutions effectively, within expected timeframes and within reasonable costs. You and your team walk on water as far as the City is concerned. Your service responsiveness, creative solutions to our challenges and overall “can do” attitude has been exemplary! I can honestly say that we would have never made our Go-Live deadline if it wasn’t for your team moving mountains to make things happen for all of our other vendors’ mishaps. Thank you so much!!! I have greatly appreciated your expertise, great customer service and reliability (and patience!). And besides that, you’re just like long-distant friends! Your team is great! You managed our emergency 2nd run last year – making corrections to about 1,600 pieces – and still got them out timely. If given the opportunity, I will recommend your company to anyone that needs this type of service. Recently, we have been working closely with you and Caselle to successfully reformat our utility statement. Both companies have been working well together, and have been willing to help us make the changes necessary. Also, we appreciate that we receive our monthly invoice in a timely manner. Keep up the good work! Mistakes are costly. When working with Information Outsource you’ll receive what we call air-traffic-controller accuracy. Count on us for First Class print and mail services, electronic billing solutions and archival.